Meet our Student Employees of the Year! 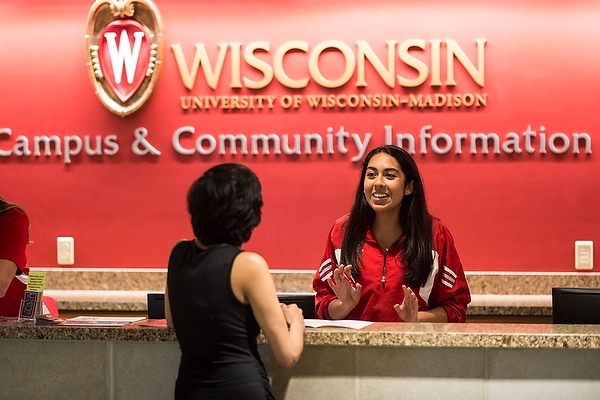 Welcome to the hub for Student Jobs, where students have access to thousands of part-time employment opportunities both through UW-Madison as well as businesses within the local community. Here, students can find meaningful opportunities that can support their educational pursuits and lifestyle while also gaining critical professional and personal skills. Positions are posted throughout the year, updated daily, for jobs in both the academic year and summer terms. Students seeking full-time professional career opportunities should use the Career Services platform Handshake. When searching for the perfect opportunity for you, be sure to utilize the filters located on the left hand side of the job board. There, you can search by job type, job category, or job outcomes. Looking for a specific position or job description? Utilize the search bar on the left hand side of the job board. There, you can search for anything which may appear within the posting. Quickly find the perfect opportunity for you by utilizing job categories to filter your search. Job Categories are clusters of similar opportunities to help narrow down the type of job experience you may be looking for. Most of these are closely correlated to career clusters which are designed to allow for you to more easily find potential opportunities which also align with your academic and future career aspirations. Quickly find the perfect opportunity for you by utilizing job categories and outcomes to filter your search. Job Outcomes are key transferable skills which the employer anticipates you will gain as a result of their position. For example, if you are looking for a position to gain communication skills, filtering by job outcome may help you find positions which may develop that skill. What's in a Job Type? On the Student Jobs platform, we have three job types to explain who your employer would be. UW Student Jobs – This job type is reserved for all positions where UW-Madison would be your employer. You can apply for all of these positions by simply hitting the red apply button, once you have clicked on the position. Local Federal Work-Study Student Jobs – This job type is for those students who have a Federal Work-Study award as a part of their Financial Aid package. All employers within this job type are within the Madison community (not associated with UW-Madison) but do require Federal Work-Study in order to apply. Local Student Jobs – These are all opportunities within the surrounding Madison area, but do not have any affiliation to UW-Madison. These positions will require you to apply through the unique employers application instructions. On the Browse Jobs page, there will be a gray button in the top right corner that says “Job Alerts”: click this button to be taken to the Student Job Alerts page. Enter your email address and select categories of jobs or enter keywords you want to be alerted to. At the bottom of the page, hit “Subscribe” to receive an email notification when new jobs are posted in those categories or with the keywords you entered. "My favorite memory at UW would probably be some time in the first month of working in the dining hall. I applied to work expecting to be put into monotonous labor with a lack of energy in the environment. I couldn't have been more wrong; the people working were all very friendly and promoted an environment that didn't feel like work at all. People were more personal than I expected too, remembering names isn't difficult but I was pleasantly surprised people went the extra step for that." Feedback, questions or accessibility issues: student.employment@finaid.wisc.edu.